Teachers, inspiring environmental awareness is invaluable work. I have two workshop to get you started. K-12 teachers ready to awaken your students love of nature. Participants will leave ready to get outside, grow, and inspire the next generation of sustainability leaders. It's worrying to think about how environmental degradation and climate change will effect the lives of today's students. In the face of these challenges, the best gift we can give kids is the life-long wisdom they'll need to love and care for the earth. But with the competing demands of covering the curriculum, managing class dynamics and giving each student the support they need it can be hard to find the time. To help you use your time effectively I want to share with you the key competencies to cultivate an environmental ethic. Sustainability leaders share two attributes that teachers can easily nurture. In their youth they spent time in nature (this doesn't have to be pristine wilderness we can find nature in our schoolyards) with a role model who loves nature (that's you!) and they have an ecological worldview. Meaning these leaders are aware of the complexities of nature and humans interdependence with the natural world. At this fun and interactive workshop, we'll discover the common thread that connects sustainability leaders. A thread we can easily cultivate by tapping into ideas already found in the curriculum, such as: valuing diversity and relationships, understanding cycles, and appreciating our interconnection with nature. Through hands-on activities in the classroom and in the Garden you’ll get lots of ideas to ignite the next generation of environmental leaders. Click here to register. You’ll be taken to a link at VanDusen Botanical Garden. 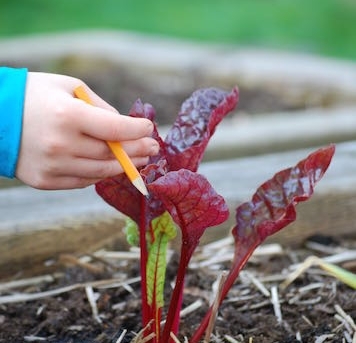 Explore how to grow a school garden in concert with nature. Learn how to attract insects and birds to help pollinate crops and eat pesky pests. Discover why you should rotate a diversity of plants that are well suited to the west coast and the school year. Investigate how to inexpensively build healthy soil. See how a school food garden can be a living demonstration of animal and plant life cycles, sustainable practices, and the value of diversity and relationships. This workshop is perfect for garden and nature-loving K-12 teachers. I can also bring these workshops to your Metro Vancouver school or district as a full day workshop or as a series of after school workshops. Sign up here and each month I'll email you resources to help you inspire environmental awareness, get outside and grow a learning garden. We value your time. We’ll only send you emails that help you green your curriculum. tips to attract animal garden helpers. Enjoy!